Age-related macular degeneration (AMD) is the leading cause of vision loss in people over the age of 60. It results in deterioration or breakdown of the eye’s macula. The macula is the central part of the retina — the light-sensitive tissue lining the back of the eye. The macula is responsible for your central vision, allowing you to recognize faces and see fine details clearly. Many older people develop macular degeneration as part of the body’s natural aging process. With macular degeneration, you may have symptoms such as blurriness, dark areas or distortion in your central vision, and perhaps permanent loss of your central vision. It usually does not affect your side, or peripheral vision. AMD alone almost never causes total blindness. People with advanced AMD continue to have useful vision using their side, or peripheral vision. In many cases, AMD’s impact on your vision can be minimal. AMD usually begins in one eye, though it may affect the other eye later. Many people are not aware that they have AMD until they have a noticeable vision problem or until it is detected during an eye examination. There are two types of macular degeneration: dry and wet. About 90% of AMD patients have the dry type; the remaining 10% have the wet type. This condition is caused by aging and thinning of the tissues of the macula. 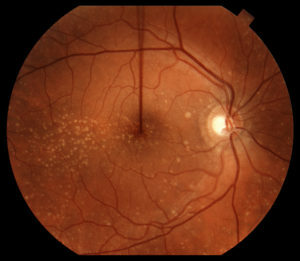 AMD usually begins when tiny yellow deposits of fatty protein called drusen form under the retina. Eventually, the macula may become thinner and stop working properly. Vision loss is usually gradual. 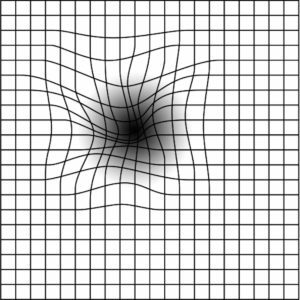 Patients must monitor their central vision on a regular basis using the Amsler Grid. If you notice any changes in your vision, you should tell your ophthalmologist right away, as the dry form can change into the more damaging wet form of AMD. While there is no treatment for dry AMD, some people may benefit from a regimen of eye vitamins for the treatment of macular degeneration. Wet AMD occurs when abnormal blood vessels begin to grow underneath the retina. These new blood vessels may leak fluid or blood, blurring or distorting central vision. Vision loss from this form of macular degeneration may be faster and more noticeable than that from dry macular degeneration. The longer these abnormal vessels leak or grow, the more risk you have of losing more of your detailed vision. Also, if abnormal blood vessel growth happens in one eye, there is a risk that it will occur in the other eye. The earlier that wet AMD is diagnosed and treated, the better chance you have of preserving some or much of your central vision. That is why it is so important that you and your ophthalmologist monitor your vision in each eye carefully.